The Panasonic RF-3000A solid-state radio receives the long wave, AM, FM and 3 shortwave bands. Long wave is 100-400 kHz, AM band is 520 to 1610 kHz. FM is from 87-108 MHz. Shortwave coverage is: 1.6-4.5, 4.5-12 and 12-22 MHz. 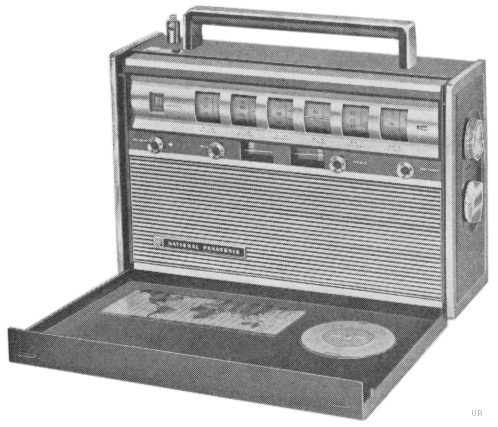 This radio features separate bass and treble controls that are affixed to pointers underneath the main tuning dials. There is also an electrical fine tuning knob. Bands are selected by a knob on the right side of the radio. The dial pointer moves from band to band. There is a tuning meter. The top of the radio features a momentary contact lamp switch and AFC On/Off switch. 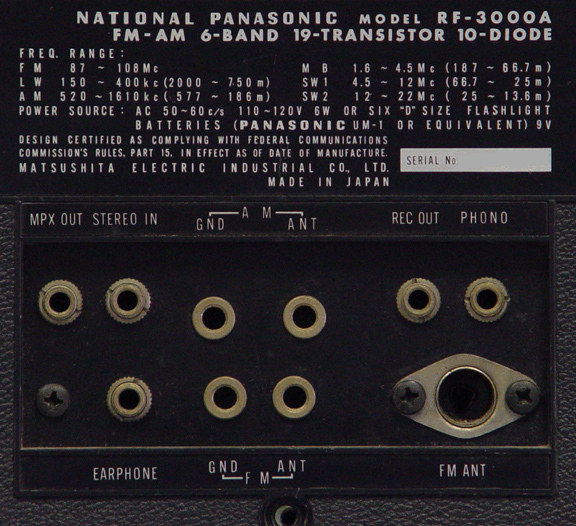 The back panel has an AC/DC switch plus numerous I/O jacks for: Record Out, Phone Input, MPX Output, Stereo Input and Earphone (mini jack). There are also external antenna jacks. This radio has a telescopic whip and a fold-down loop antenna. A full sound is delivered via the 5 and 4 inch speaker system. Operation is from 117 VAC or six D cells. 14.6 x 10 x 5.5 inches 13.8 Lbs. Copyright 2008-2010, Universal Radio, Inc.